This is a project that we finished this week. A GREAT house built less than 10 years ago, but the ductwork and insulation were installed incorrectly. As a result, the subfloors had begun to rot from the bottom up. In the course of our investigation, we found plumbing leaks and wet, sagging insulation under the floors and in the duct work. Under the house was a very moist place, in need of a dehumidifier and encapsulation. We removed and disposed of all of the saturated insulation as well as the plastic on the floor. This allowed the subfloors to dry out for a few days. There was also quite a bit of mold so we chemically treated those areas then mechanically removed any problem areas that did not appear to be free of contaminates after the chemicals had been applied. We replaced the old, moldy ductwork with a fully insulated and sealed system, including all boots. 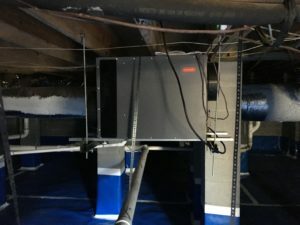 All of our duct systems are designed to a specific minimum CFM of airflow that is considerably higher than is typically used by new-construction contractors. This serves to relieve pressure on the system making it more efficient and quieter. Three of the existing supply air boots were found to have been mounted under cabinets and were COMPLETELY unvented. We relocated those which noticeably improved the airflow in the house. During the course of our work, we found and repaired 2 plumbing problems that would have created new issues left undiagnosed. We also found and replaced some minor rot in some of the floor joists. 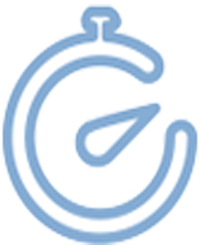 To remedy that, we consulted with an engineer and performed those repairs, as well. 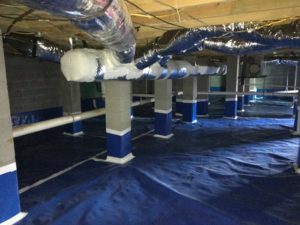 Once the HVAC, leaks and structural issues had been addressed, we installed and taped a 15 mil vapor barrier on the floor of the crawl. Fully encapsulated the space by installing installed sealed, break-away panels on the openings in the foundation walls. We then used a vacant panel in the fuse box for power for the new commercial grade 90 pint dehumidifier.